Ever since I saw the beautiful picture of the Lake Parashar on the state calendar of Himachal Pradesh Government, I was hooked to the heavenly looks of the lake and I nurtured a dream of visiting the Parashar Lake. During my last visit to Kataula, in the month of March, where my husband is posted, we had almost planned to visit the Parashar Lake, had it not snowed heavily the previous night. I was told that the road to Parashar would be closed and after the snow fall, it was much too difficult to trek the steep ascent to Parashar! Reluctantly and grudgingly, I acceded to the advice of all and dropped the planned visit to Parashar. But this dream never left me and during the last week of May, we once again planned to visit Parashar Lake. I prayed to the weather god to have mercy on me as it is said that the weather changes in an instant at Parashar top. The enquires from the locals revealed that the road to Parashar is jeepable and one has to walk only some 500 meters to reach the temple but if one opts to walk, then the trek starts from Baghi that is 35 kms from Mandi. As we were staying at Kamand from where Baghi was merely 20 kms, we planned to trek from there on. And finally one fine morning we started for the destination – the Lake Parashar! I had packed a workable lunch and some fruits. I wanted to take water bottle as well but thought of the hilly water sources and didn’t go for the water bottle – a decision to lament later on. We got a bus in the morning at about 7 AM and reached Baghi at 8-15 AM. The road distance from this place to Parashar, as written on the milestone was 23 kms. But as we had decided to trek, so we diverted towards the left side. I was pleasantly surprised to see a board put by Himachal Tourism that displayed the information about the trek route to Parashar. I was excited and thrilled. I was happy too that the trek must be having signs through the trek route as the Tourism Department has put this signboard at this place. I looked around and found that we two were the only people to have taken this direction. I was a little alarmed as well as we had not taken any local person along with to guide us enroute, but decided to keep these thoughts to my ownself. My enquiries from the locals have revealed that there is a steep ascent upwards and the trek would be narrow and slippery too. All my fears were put to rest, the moment we started towards the path leading us to the lake. It was at about 8-15 AM and the sun rays were peeping from behind the mountains, sweeping all around us in a golden hue. The water spring, the small house having a wood-cutting machine run by the water made the spectacle divine. I wondered if it was so beautiful at the beginning of the trek then how beautiful it will be on the top. The pathway was quite wide by the standards of the hilly terrain and I was quite impressed by it. The water in the small “khadd” on one side, and the Deodar trees aiming for the sky on the other side, made a rare combination. I could not help clicking photographs. The downward valley on the left side of the path had such green vegetation and the cauliflower fields – lush green and healthy – made me vie for the life of the people who lived there. The wood and stone houses on the side spoke of the simplicity and I would have traded my home for that. I was thinking – that the path is so good, so where is the steep ascent? We stood at one point wondering which way to take as the path had bifurcated and there was no sign of any direction. Standing bewildered, we saw a woman grazing animals and asked her for directions. I don’t know what would we have done had she not been there. We had to divert towards the right side and suddenly the path started to meander through the thick jungle of Deodars and Rondodendron trees. There was silence touching on serenity all around. Ecstatic and full of excitement we were climbing up and up. All that I could see was the thick jungle around us, the rays of the sun peeping shyly from the dense leaves above us and dry leaves at our feet making our ascent difficult. It must have been an hour of continuous ascent and nothing seemed in sight. There were no signs for direction as well. I could not sight any water spring flowing down the steep path and repented having left the water bottle at home. We sat down for two minutes and started waling again, up, up and up. The dense trees had made the entire place shady and dark and the only sign of the light was the rays peeping dimly from behind the trees. Looking down would make my head swirl and I preferred to walk and look up. But where was the Parashar Lake. We were seriously assailed with doubt – hope we haven’t lost the way. But luckily just like an omen, the moment we would doubt it, we would see some sign in white paint inscribed on some stone showing an arrow. Thank God, some one had been wise enough to put some signs in the jungle. It was almost 2 hours of continuous steep walk and my face flushed red with blood rushing to my temples with fatigue and anxiety. Yes, there were some other tell-tale signs for the right trek – some empty pouches of Paan Parag etc which we found lying on the way. They would signify that someone else surely had used this trek, though we seriously doubted it. We were thirsty and water was nowhere in sight. I was really angry with myself for not having brought water bottle. We don’t, ordinarily, carry water while trekking in the hills where natural water is in abundance but this time I felt the pinch.The top of the hill was nowhere in sight and we were really tired. It was almost two and a half hours since we had started the trek and still were surrounded by trees and a sense of uncertainty. The ascent was becoming steeper and more tough and it showed on our faces and increased palpitation of heart beats. Another sign of arrow on a stone was like a sign from the gods and we continued the trek. The scenic beauty was captivating, but honestly, I had little energy to take more pictures and just wanted to reach the top, if we could. Suddenly the darkness seemed a little less and the sunlight flooded the surrounding and before we could know, we had reached a plain plateau. It was so refreshing and we looked around the imposing mountains all around us that were at our eye level. We wondered at the height we were standing at and looked around to see the Parashara Lake which was still invisible to our eyes. Another trudging walk, though we were bone tired at this point of time, taking the electricity wires overhead as the direction to move on. Some structures raised their head from behind a green plateau and our heart was filled with relief. We reached those dwellings where a woman was seen watching us curiously. These were the dwelling places of the Gujjars where they stay during the summer months. She was really surprised, as very few people, other than the locals, trek to the Parashar Lake these days. We craved for water and she was more than ready to offer us food as well. I went inside her dwelling and marveled at the cleanliness of the humble abode. Her rustic charms and genuine hospitality made us forget all the tiredness and we thanked her profusely. A walk of some more distance and we felt as if we were transported to a new world – a world I had never seen. The majestic Parashar Lake and a small temple on one of its side! The dream had come true. We were standing at an altitude of 2,550 metres from the sea and we seemed to have reached near to the sky. The emerald green pastoral slopes, the blue sky overhead, clouds adding to the beauty of the deep azure of the sky and the crystal clear water of the lake. It felt an out-of-the-world experience. The small temple whose top roof seemed to touch the sky was so quiet. The priest was appreciative of our having walked up to the temple and talked to us at length. It was 30 May, 2007 and the annual fair was to start on June 16, 2007 so the roofs were being mended. 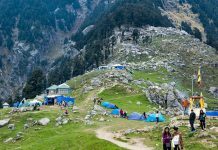 The people of the adjoining area throng this temple during this annual fare and the village deities of this vast mountainous area are carried to this heavenly spot to pay obeisance to sage Parashar. According to him, Bansen, the king of Mandi, got this temple built in the 13th century and the temple is in Pagoda style. Though according to the folklore, it was a small child who built this temple all alone, and he took 18 years of time to build it. Another interesting information that the priest gave us was the whole of the temple is built up of a single Deodar tree. What a big tree it must have been. It is said that sage Parashar meditated at this place for a very long time. Parashar temple is dedicated to sage Parashar who is the patron god of this area. Spectacularly situated beside the lake, the temple is an example of Pagoda style of architecture and has three tiers structure with the lower two roofs in pent roof form covered with thin slates. The conical roof is covered with tin roof. The best feature of the temple is the intricate wood carving designs that captivate the onlookers. The carving features – presentations of gods and goddesses, floral ornamentations, heraldic beasts – are breathtaking. The knotted serpents look magnificent. The door of the sanctuary, composed of seven door jambs, is elaborately designed. The shrine houses a colossal image of sage Parashara. The lake looked majestic. The clear sky, dotted with some clouds and the verdant slopes made it look heavenly. I took many shots but though I wanted so much to walk up another ridge to take few pictures from another angle, I had little energy left in me for walking up any further. I thought that may be next time when we come, I would take pictures from another angle. The tea shop near the lake provided us with such refreshing and invigorating tea that all the tiredness vanished. We were now ready to take another journey – downwards to reach Baghi in time to catch the last bus at 3 PM. So with a promise to come once again, we left the place albeit with a heavy heart. We literally walked like hill goats on our way down, and honestly speaking, trekking down was more tiresome than trekking up. The legs were sore and painful, but we walked on. When we reached Baghi and looked at the watch we were astonished to see that the trek down had taken two hours, whereas the upward trekking had taken three hours. We were bone tired and taking a step was torturous but we had to walk. When we finally got into the bus, both of us looked at each other and split into a full laugh – a laugh that spoke of our achievement. The trekking trail to Parashar is not for people with weak hearts and weak composition. It is a difficult trek where you test the limits of your physical ability to its limit and is not at all suggested for people who trek merely for the sake of trekking. We did some wrong planning but now are in a position to tell others of the right way to trek to Parashara. The trek is lonely and there is no human habitation on the way to Parashar so one has to be careful while planning for the trail. The trail is narrow, steep and slippery and one wrong step can make you fall several metres down with no arrangement to pick you up, so plan the trek in a group and with back up planning. 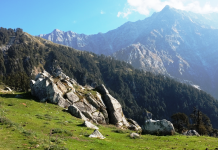 The Himachal Tourism could do a wonderful job, if they provide suitable signs on the trek route to direst the trekkers. The trek is enthralling for its virgin looks and still has the charm of old ways of walking long distances. The trek for us was a check-up of our physical fitness and luckily both of us – my husband and I – came out successful and fit. I plan for another visit to Parashar very soon as the ethereal beauty of the place makes you crave for more and more visits. The pictures are excellent. Seem to be as a painting. Time has stopped still. And I just hope it just remains the same forever. Oh Yes… the nature could do without the Pan Parag pouches mentioned by you. Very nice, beautiful picture of the Lake Parashar and best story on trekking.